Over the years we have tested and evaluated the staying power and effectiveness of many DC 12V and 24 Volt pumps and one thing we've constantly noticed is that no matter what type of pump you buy, these 12V pumps are not going to give you years of service so buy a good cheap one! When I say cheap I don't mean some ebay special deal on a pump made in some far away country without care for product consistency I mean buy a good quality pond pump that doesn't cost too much because you will be buying replacements every 3 to 9 months of continuos usage. If someone gives you a one year warranty then you might want to take a closer look because the pumps we use have a 3 month and 6 month warranty. That may not sound good...but that is the reality of solar dc systems as the current technology exists. Up until now most DC air pumps and battery powered DC compressors had limited reliability. Most DC pumps we've seen offer a 3 to 6 month warranty and if you don't know exactly what you're doing as far as setting up your solar aeration system you can quickly burn out your motor. We have finally found a commercial-grade line of pumps that come with a one-year warranty and these diaphragm, linear air compressors are easy to service and provide long lasting battery or DC current performance. These commercial-grade DC air compressors offer superb performance and durability. It's not always possible to run some 14/3 gauge wire down from the nearest hydroelectric pole across a field into a valley and around a gully to reach a pond to power a pond aerator. A windmill is nice if you have wind but when that isn't the case the only option is to build a solar aerator. Often, as many of our friends know by looking on the Internet, a solar aeration system that has any sort of potential for long-lasting sustainabilty is going to cost upwards of $5000 and beyond. At that price I know a lot of pond owners who would rather blow bubbles into their pond through straws while canoeing to keep the fish alive and algae down. Typical applications include live fish transport on trucks or fishing boats; however, they can also be used in emergency or solar-powered situations. The simple design of these DC air pumps makes them easy to maintain and repair (oilless, easily accessible brushes and diaphragm). Pigtail wires for connection to your battery or DC configuration included. 60 LPM and 100 LPM models include either plastic or steel housing cases and do not require additional housing for outdoor use. 30 LPM unit has no housing and must be enclosed for outdoor use but this 30 LPM unit includes a lighter adapter to fit into car lighter plugs as well as pigtail wires. Running an air pump off a car battery is a much cheaper option and while I am not a solar aeration engineer I know that a cheap direct current air pump or diaphragm compressor can be bought for very cheap. Now I know that an expert in solar panels and off-the-grid engineering could explain what sort of linear current booster is needed to correctly match the starting amperage and running amps of the pump but I can't even come close to understanding let alone explaining. I know one thing though. A Direct Current 12 Volt air pump or air compressor will run off of a battery; a deep cycle battery, car battery or boat battery but of what sort brand or amp hour rating I couldn't tell you. All I can do is review the solar air pumps we've used and heard about over the years and offer some good, cheap pumps for you all who know what sort of solar panel setup and current booster is required to make it work. When I say cheap I don't mean some ebay special deal on a pump made in some far away country without care for product consistency I mean buy a good quality pond pump that doesn't cost too much because you will be buying replacements every 3 to 9 months of continuos usage. If someone gives you a one year warranty then you might want to take a closer look because the pumps we use have a 3 month and 6 month warranty. That may not sound good...but that is the reality of solar dc systems as the current technology exists. Thomas 5010 Air Pump - Thomas Diaphragm Pump 5002 VD BLDC - Thomas 5010 VD DC - Decent Pumps but higher than desired burnout rate and some issues in consistent pump construction. The 5010 series is in the range of 0.09 CFM @ 2.9 PSI which is barely enough to function a single small airstone and we found that parameter least pleasant. The Thomas 12 Volt 1/10hp Air Pump is similar; a good product. Thomas 007 & 008 Series Air Pumps - Very good pressure delivering over 20 PSI and 0.6 CFM make this series decent but again the units we've seen featured in systems cooked too quick. Thomas 907 and 2907 Series Air Compressors - These are good quality but high priced and again the inconsistency of the units makes us a bit nervous but the fact they can deliver 3.2 CFM and 14 PSI make this little grinders seem like a good deal if you can buy a few when they fry. Solar powered aeration systems for remote ponds and lakes where power is not available, too expensive, or if you are off grid. Where a windmill isn't viable the solar direct systems, requiring no batteries, are also an environmentally conscious solution. These plug and play solar systems come complete with high efficiency solar panels, energy efficient compressor, high volume cooling fans, fully adjustable manifold housed in weatherprrof ventilated cabinet. Diffusers are micro-bubble technology, self-cleaning, non-clogging membrane diffusers emit millions of tiny bubbles that increase dissolved oxygen levels while eliminating stratification, improving water quality and clarity. The systems are available as solar direct systems with 12 volt direct current pumps or as a hybrid solar/ac system that will operate with solar power when possible but will automatically switch to AC power when there is not enough sunlight to operate the DC pump. Battery Free operation. We have eliminated the expense of rechargeable batteries and charge controllers by offering a direct drive (DD) aeration system. This reduces your cost along with the maintenance issues associated with a lot of extra components. Each system includes 2 panels with aluminum mounting brackets and adjustable pole bracket with variable angle configuration, compressor(s), an OWS DD solar controller module, heavy duty steel cabinet with locks, mounting pole, solar power disconnect switch, cooling fans, pressure gauge and a pressure relief valve. Each DD solar aerator can be operated by itself and totally independent of other aeration systems or it can be combined with a windmill aeration system to give you a longer operating time each day. It can also be combined with an electric aerator or windmill and electric aerator combo. Of course, the mountings for panels, enclosures for batteries and compressor can be purchased from your local dealer. The system can be permanently located at the site or mounted on a trailer for easy relocation if livestock or cattle or involved. While pond aeration systems are usually maintained on site the winter watering systems are known for being moved from pond to pond. A linear current booster is required to combine the solar direct power from the panels to the DC powered pump and this is usually a simple system that can be picked up at a local supplier of parts designed for alternative power sources. Your typical aerator includes a bubble diffuser which can be a EPDM type disc diffuser of nine or twelve in diameter membrane diffuser or an airstone or any manner of diffuser tubing also known as diffuser line, de-icing hose or bubbler line. While many systems can include a length of airline, often 100 feet, there is the self sinking weighted tubing variety of airline that makes installation much easier. Standard airline will float and it is rare that one of my clients will decide to buy regular poly plastic tubing instead of the weighted tubing because it makes installation so much simpler. Still, if saving money is a priority you should use floating airline available for about 30 cents per foot at the local hardware store instead of self-sinking tubing that costs from $1.15 TO $2.25 per foot. For those of you who want to go beyond the solar direct system there exists many retailers who specialize in solar pond systems that include deep cell battery operated systems that can provide continuous aeration over 8 to 12 hours per day due to their deep cycle battery systems. Fundamentally these solar pumps are the same but instead of operating only when sunlight hits the solar panels they have the ability to charge deep cell batteries during the sunny hours of the day and can operate the pump during times when there is no light which is often preferable as aeration systems an their best will function only during the evening hours when their is no chance for aquatic plants to contribute oxygen due to photosynthesis. **Note: You must accept that creating and building and setting up a solar aeration system is a very very VERY complicated affair and while we are offering the parts and instructions on how to build your system we cannot provide ANY help or installation guides. If you wish to have a simple, turn-key system then please contact someone else as we are unable to privide any help beyond this list of products and parts. Any failure of the system to function as expressed, implied or as desired is not gauranteed. Solar aeration systems are a very touchy and persnickety project so if you wish to buy or purchase from us then please do so at your own risk. We have provided a list of parts and instructions but do not imply or warranty that this will actually work! Not sure who makes their 814 high volume compressor but they seem to work well in their all inclusive systems. ,The SB-1 Solear® Lake Bed Aeration System has been designed for smaller pond and lake applications up to 1 Surface Acre in Size. 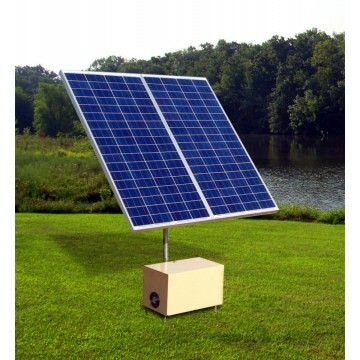 The SB-1 package system includes, 1-120 watt solar panel, 1-814 high volume compressor, wiring harness, 30 amp charge control center, adjustable manifold, 1 each-9 in duraplate™ non-clogging maintenance free diffuser, small fiberglass cabinet with sound reduction package, 1-210 amp hour deep cycle solar batteries, fittings package, 12/24 volt smart box convertor, no tubing included and 2.5 in SP mounting structure. Customer to furnish a single 2.5" sch 40 steel pipe 8-10 feet length for mounting solar panels. Optional automatic solar tracking system available. Upto 20 hours per day run time. Fully automatic system. Email us for algae information or with your questions.